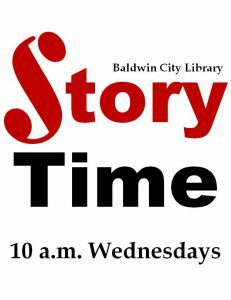 Story Time with Miss Leigh Anne is at 10 a.m., Wednesdays, at Your Baldwin City Library. We’re always happy to make new friends. Won’t you come read with us? Game On! 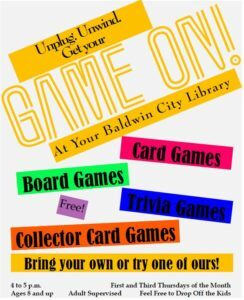 at Your Baldwin City Library is from 4 to 5 p.m. on the first and third Thursdays of the month. Bring your own or try a new game, we’re open to almost anything. Ages 8 and up, adult supervised, feel free to drop off the children for an hour. Unplug. Unwind. Get Your Game On! 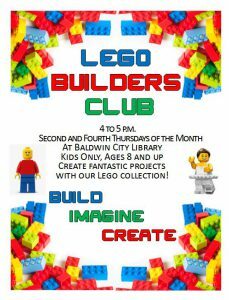 The Library Lego Club is from 4 to 5 p.m. on the second and fourth Thursdays of the month at Your Baldwin City Library. Come build to your heart’s content. Ages 8 and up, supervised, feel free to drop off your kids for an hour.